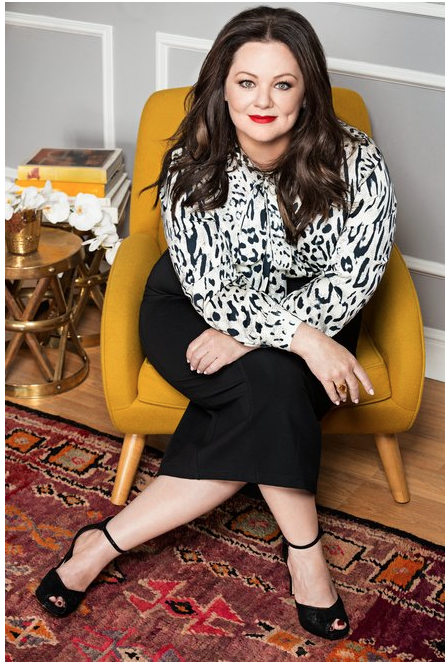 My Favorite Actress/Comedian Melissa McCarthy has just debuted her fashion line titled Melissa McCarthy Seven7. ” I just wanted to do a basic closet that I couldn’t find.” says Melissa with a sigh about her new line. The Line Launches September 1. 2015 but she will be introducing a sneak peek of her line to the world August 13 on HSN (I will be tuned in). Even though she may be known for being the funny girl with the blunt personality and the mouth of a sailor in her movies “Heat” featuring Sandra Bullock “Gilmore Girls” ‘Bridesmaids” “Spy” “Tammy” & More. Melissa expresses that she’s had a passion for fashion came before acting and comedy.Back in high school, the then-inspiring designer would clip Vogue patterns—“That’s what the cool kids did!”—before flipping through the magazine pages for inspiration. “Do you mean, do I still have my Thierry Mugler and [Jean Paul] Gaultier scrapbook? Yes! Yes, I do,” exclaims McCarthy with the giggling energy of a teen balling out on her first designer item. “I went into clothing and textiles in college and moved here with [shoe designer] Brian Atwood. I was going to finish at FIT and he made me do stand-up on the second night.” Melissa says she has a jokingly grudge against her long time friend Mr Atwood being that he has one of the most successful shoe line’s in the fashion industry lol. Melissa also expressed to Fashion bible Vogue magazine her style she says “Some days I want to be prim and proper, and others I want to be in a band.” I lost the ability to do that with clothes, speaking of her having stylist style her for everything she attended.” The line is comprised of “everything a woman needs,” she says, from dresses and tailored separates to denim, all priced under $150: “The fun of it is you should be able to put these things together and not have to make a choice about going out to dinner or getting the sweater. Wear the sweater to dinner.” Melissa’s line will be bringing runway looks to women who don’t fit sample sizes —which ranges from sizes four to 28 and is destroying the myth that only all-black looks can be slimming, with an spontaneous, and a flattering use of color-blocking. Keep Scrolling to get a little sneak peak of Melissa McCarthy Seven7 line. Leave me comments below and tell me what you think of her line I absolutely love it!